NASA satellites captured striking images showing the scale of multiple devastating wildfires raging throughout Northern California and the West Coast. Altogether, the California wildfires have killed at least eight people and scorched more than 200,000 acres. Gov. Jerry Brown has declared a state of emergency for Lake, Mendocino, Napa and Shasta Counties. Over the weekend, President Donald Trump ordered federal assistance "to supplement state, tribal and local response efforts," according to the White House statement. 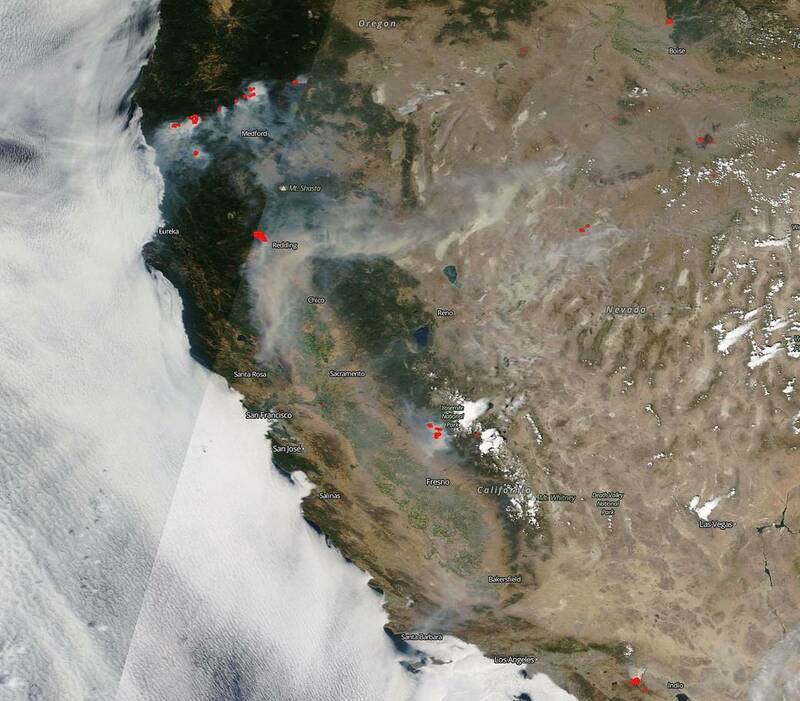 NASA's Aqua satellite on Sunday captured wildfire smoke billowing throughout California, seen in the image above, and drifting eastward toward Utah and beyond. Actively burning areas are outlined in red. "The whole of the western coast looks like it is on fire," the statement issued by NASA said. 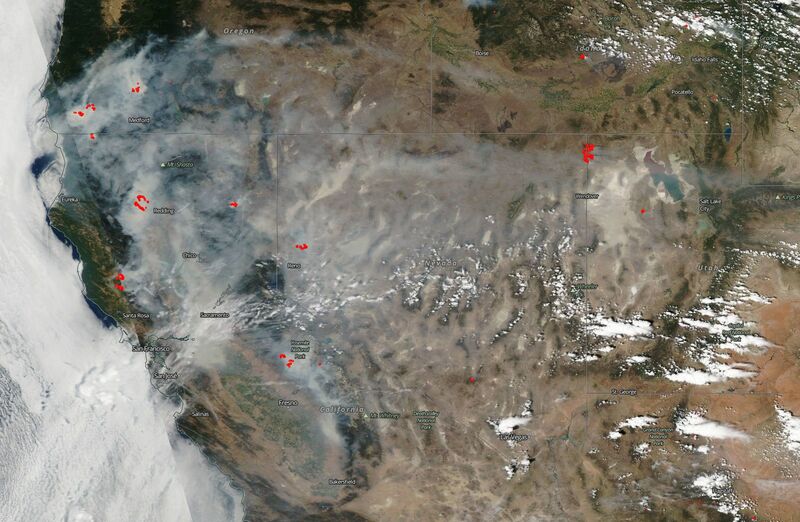 Similarly, NASA's Terra satellite on Thursday captured the breadth of multiple wildfires that have swept through the West Coast, from Oregon and Northern California to south of Los Angeles. The largest of the California blazes, Carr Fire in Shasta County, doubled in size over the weekend to 98,724 acres and was 20 percent contained as of Monday morning, according to Cal Fire. The fire has so far destroyed about 1,000 structures and claimed six lives. In Mendocino County, two blazes scorched almost 56,000 acres. Firefighters battled the blaze overnight but "weather conditions will continue to challenge firefighters as hot, dry and windy conditions persist,” according to the Cal Fire incident report. As of Monday morning, the firewas 10 percent contained. The Ferguson fire, which led to a partial closure of Yosemite National Park, is 30 percent contained as of Monday morning. Two firefighters died battling the blaze, which has scorched 56,659 acres. Several mandatory evacuations are in place and more information can be found on the Cal Fire info page. So far this year, California wildfires have scorched nearly 410,000 acres, the highest year-to-date level in a decade, reports Reuters. An unrelenting bout of hot and dry weather in Northern California has contributed to unfavorable conditions for firefighters battling to contain the fires. "The hot, dry weather that contributed to the deadly California firestorm shows no sign of letting up into the first part of August," said the NASA statement accompanying the images.